Most natural diamonds are formed at high-pressure high-temperature conditions existing at depths of 140 km to 190 km in the Earth mantle. Carbon-containing minerals provide the carbon source, and the growth occurs over periods from 1 billion to 3.3 billion years, which respectively corresponds to roughly 25% and 75% of the age of the Earth. Diamonds are brought close to the Earth surface through deep volcanic eruptions by a magma, which cools into igneous rocks known as kimberlites and lamproites. Diamonds can also be produced synthetically in a high-pressure high-temperature process which approximately simulates the conditions in the Earth mantle. An alternative, and completely different growth technique is chemical vapor deposition. Several non-diamond materials, which include cubic zirconia and silicon carbide and are often called diamond simulants, resemble diamond in appearance and many properties. 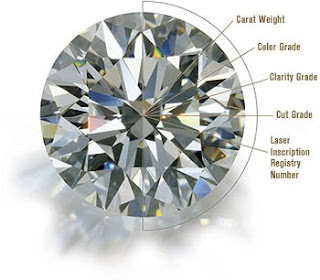 Special gemological techniques have been specially developed to distinguish natural and synthetic diamonds and diamond simulants. The diamond hardness depends on its purity, crystalline perfection and orientation: hardness is higher for flawless, pure crystals oriented to the direction (along the longest diagonal of the cubic diamond lattice).Therefore, whereas it might be possible to scratch some diamonds with other materials, such as boron nitride, the hardest diamonds can only be scratched by other diamonds. In particular, nanocrystalline diamond aggregates were measured to be harder than any large single crystal diamond. Those aggregates are produced by high-pressure high-temperature treatment of graphite or fullerite (C60). The hardness of diamonds contributes to its suitability as a gemstone. Because it can only be scratched by other diamonds, it maintains its polish extremely well. Unlike many other gems, it is well-suited to daily wear because of its resistance to scratching—perhaps contributing to its popularity as the preferred gem in engagement or wedding rings, which are often worn every day. The hardest natural diamonds mostly originate from the Copeton and Bingara fields located in the New England area in New South Wales, Australia. These diamonds are generally small, perfect to semiperfect octahedra, and are used to polish other diamonds. Their hardness is associated with the crystal growth form, which is single-stage crystal growth. Most other diamonds show more evidence of multiple growth stages, which produce inclusions, flaws, and defect planes in the crystal lattice, all of which affect their hardness. It is possible to treat regular diamonds under a combination of high pressure and high temperature to produce diamonds that are harder than the diamonds used in hardness gauges. Industrial use of diamonds has historically been associated with their hardness; this property makes diamond the ideal material for cutting and grinding tools. As the hardest known naturally occurring material, diamond can be used to polish, cut, or wear away any material, including other diamonds. Common industrial adaptations of this ability include diamond-tipped drill bits and saws, and the use of diamond powder as an abrasive. Less expensive industrial-grade diamonds, known as bort, with more flaws and poorer color than gems, are used for such purposes. Diamond is not suitable for machining ferrous alloys at high speeds, as carbon is soluble in iron at the high temperatures created by high-speed machining, leading to greatly increased wear on diamond tools when compared to alternatives.